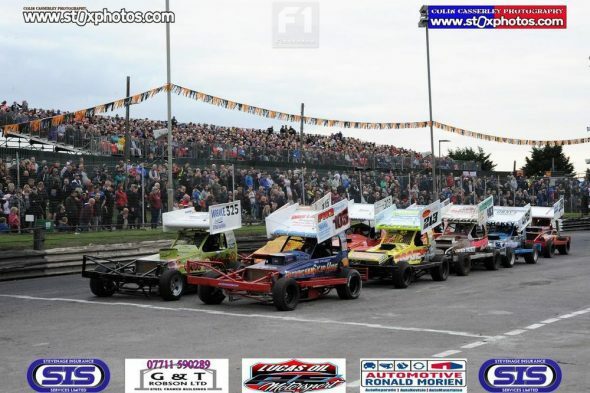 The first race for the F1s on World Final Night was the Consolation Semi Final, which saw a huge field of cars grid up. 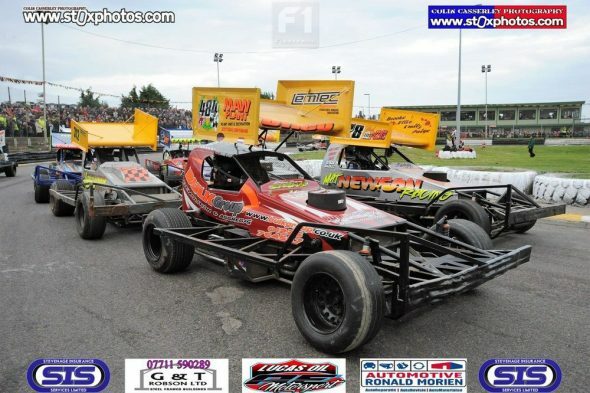 Russell Cooper (415) led them round for the start and it wasn’t long before sparks started flying. 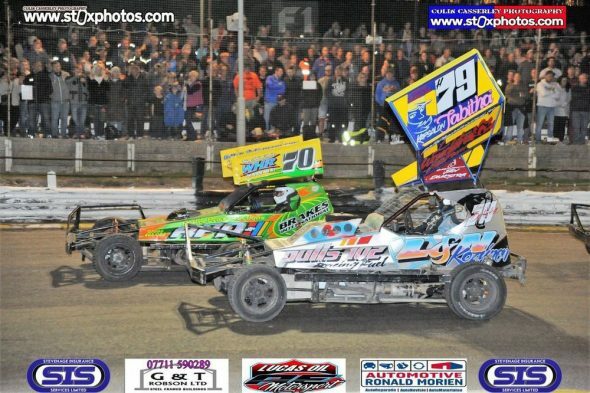 A big pile up on turn 4 took out Paul Harrison (2) while Danny Wainman’s run of bad luck continued as he retired to the infield within a couple of laps. 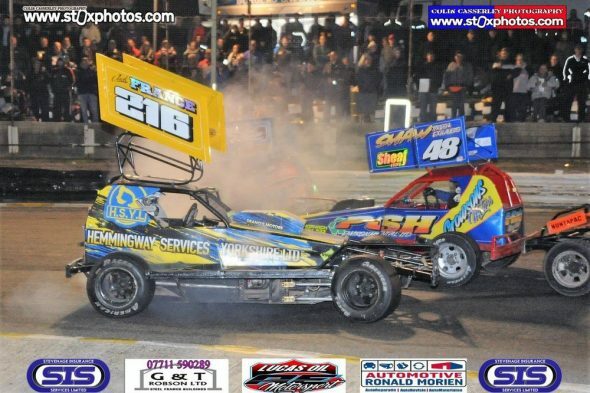 After an early caution to clear the track, 415 led them away for the restart ahead of George Elwell (501) and Micky Randell (172). 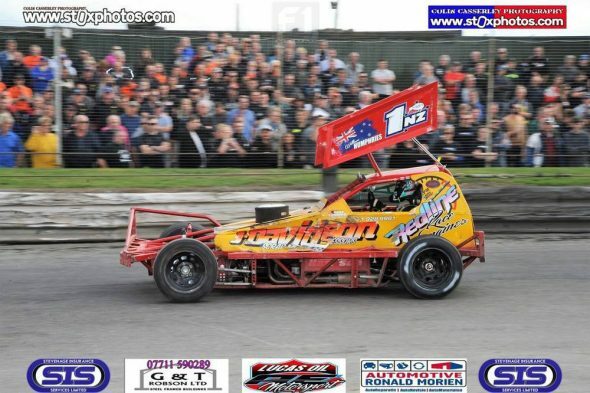 Newson (16) was making rapid progress through the field; already up to sixth after only a couple of racing laps. 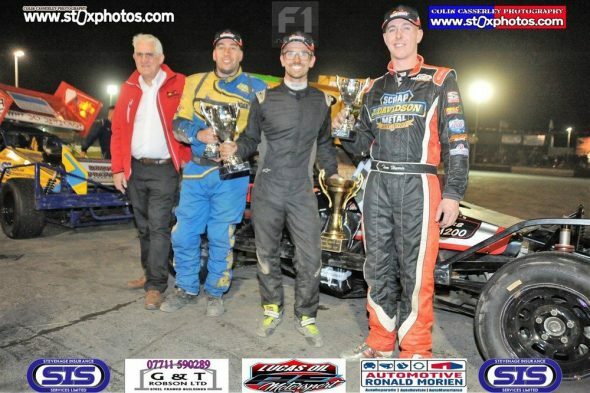 As the green flag dropped again, Newson pushed his way past Finn Sargent (526) to take fifth, while Elwell moved into the lead. Newson was still on a charge and was soon up behind 501. The bumper came in and Elwell was moved aside. 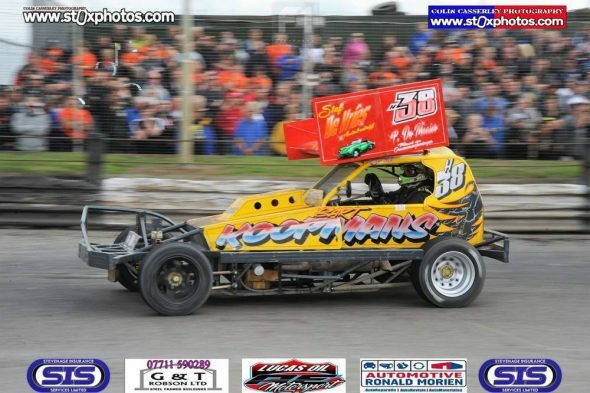 The 501 car maintained second place until, with 5 laps to run, a big hit came from a lap down John Thompson (312), clearly still aggrieved about that Buxton incident in June. Elwell’s car was left hanging on the armco in turn 2. This promoted Randell to second, ahead of 220. That’s the way it stayed for the final few laps. Newson and Randell taking the last two places in the World Final. 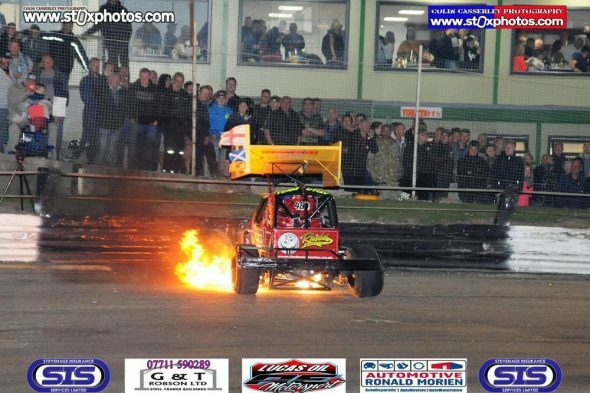 Heat 2 saw another large field of cars, including drivers from the Netherlands and Northern Ireland. 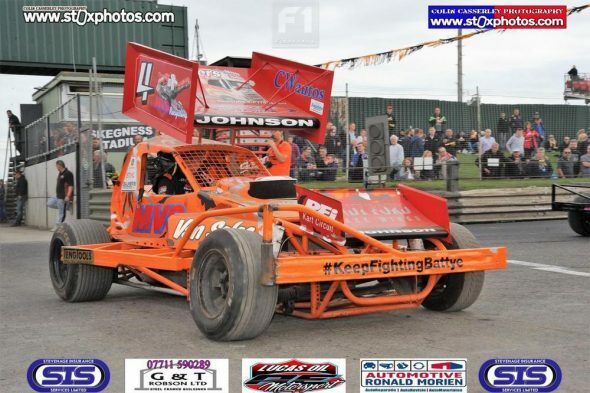 The race itself was a flag to flag victory for Rich Masterson (103). H525 of Nigel de Kock took second, with Stuart Shevill Junior (518) rounding out the top 3. 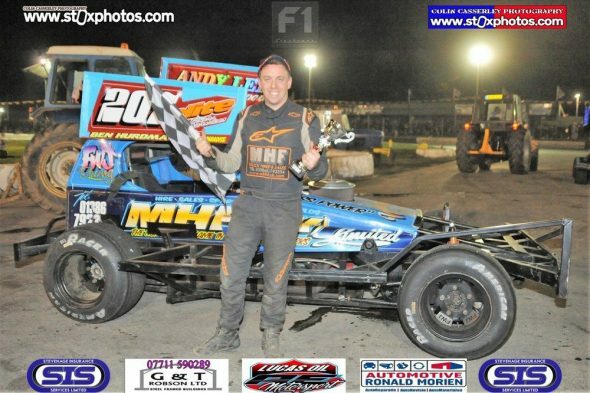 The next race up for the F1s was the World Final, which saw a near flag to flag victory for Stuart Smith Junior (see separate race report). 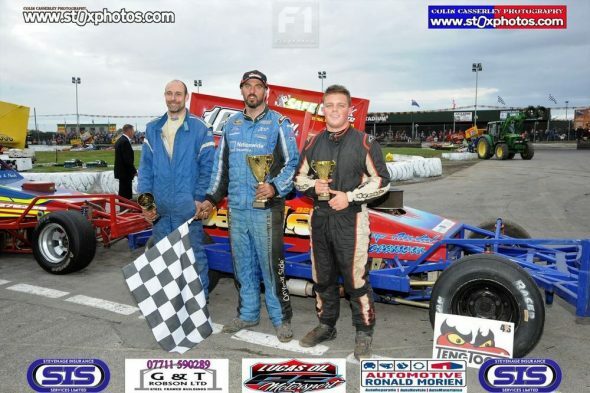 Defending champion Nigel Green came second, with Dan Johnson taking the final podium place. Consolation #1 gridded just as a small fire broke out on the back straight grandstand; caused by the remains of a firework. 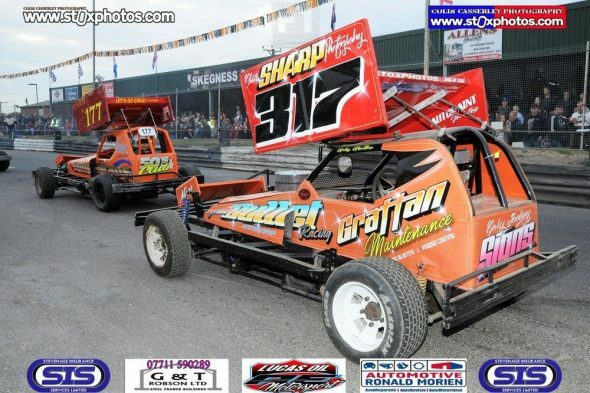 The around 36-car field was led away by Craig McLoughlin (115) in a Newson hire car. 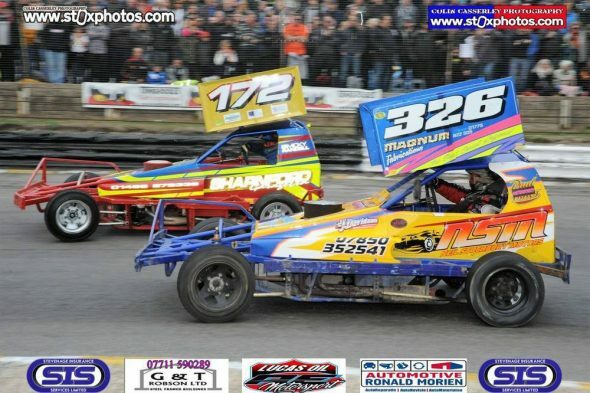 It wasn’t long before a pile up on the exit of turn 2 brought proceedings to a halt again, with yellow flags needed to clear the stricken cars of Danny Wainman, Frankie JJ (555), Evert van der Berg (H12) and Steward (126). 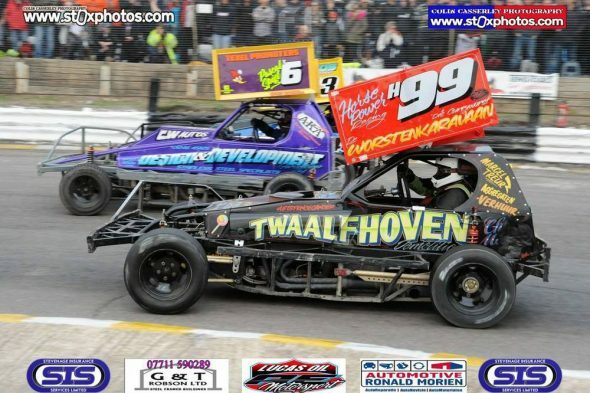 Cooper was the leader at the restart, ahead of McLoughlin (115) and Albert Sikkema (H215). Soon the caution was out again; this time for 115 car, which was stuck on the fence. Harry Steward (126) and Hans Baegen (H65) had also tangled. The 415 car once again led the field around for the green but it wasn’t long before Elwell had taken the position away from him. Soon, 207 moved into the lead, while 415 dropped further down the order. A battle between 207 and 501 ensued with the pair trading the lead for the next few laps. 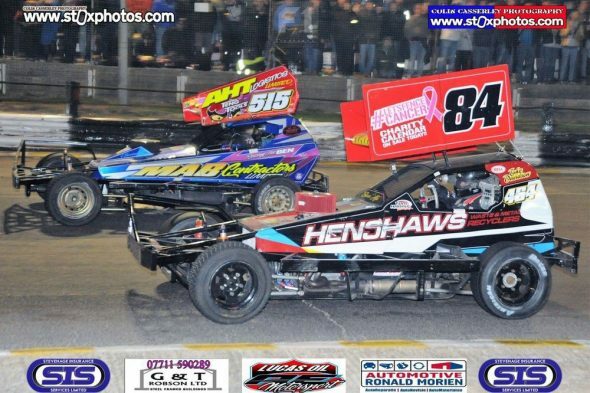 Eventually Hurdman prevailed and Elwell, hassled by a lap down Danny Wainman lost second to a fast moving Alex Wass (283). 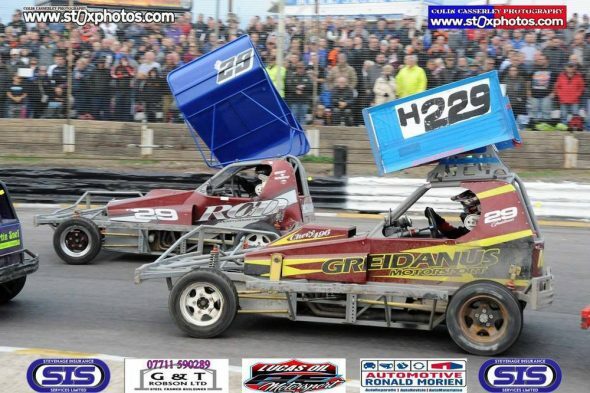 Fewer cars (only 23) gridded for Consolation #2, which was led away by Matt Rogers (213) and Colin Nairn (280). 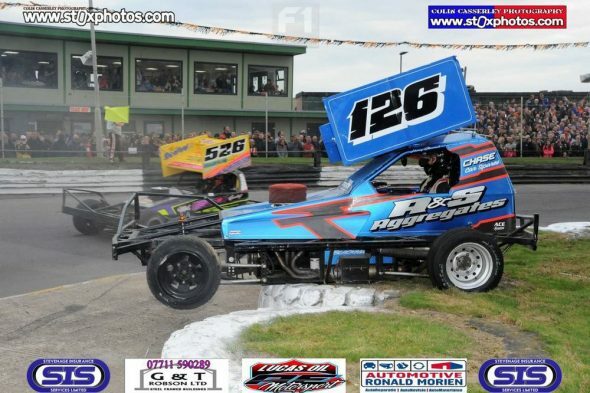 Nairn clobbered the fence on the start, leaving 213 to take up the front running. 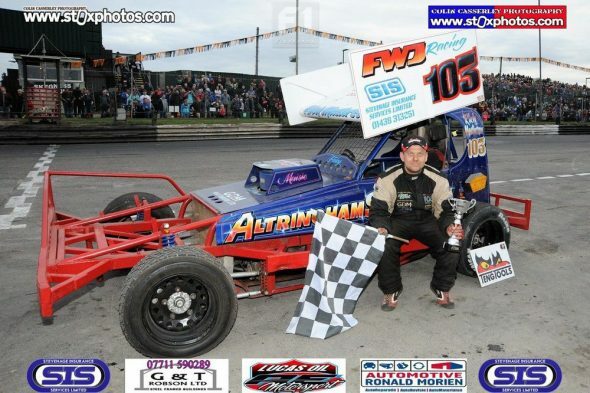 Fairhurst was one of the biggest movers in the early stages. By the half way stage, it was 172 in the lead from 70 and 217 and that’s the way it stayed until the flag. 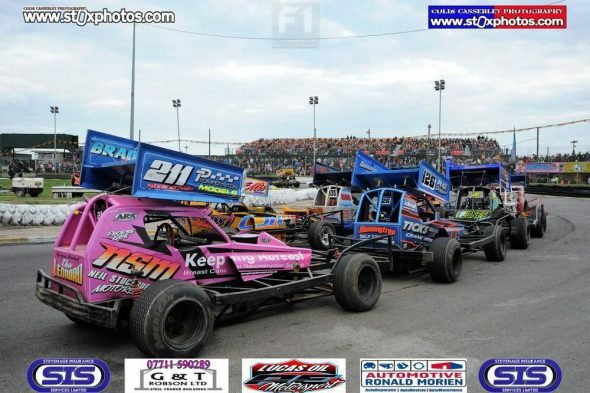 A full 36-car field gridded for the Harry Smith Memorial Final following another spate of fence repairs. 103 and 325 set the pace. After a big push into turn 1, Catsburg (H99) spun, taking Robinson (H177) and Gray (124) with him. Meanwhile H79 and 11 tangled on the back straight and H380 became stuck in the tyres on the home straight, bringing out the caution. 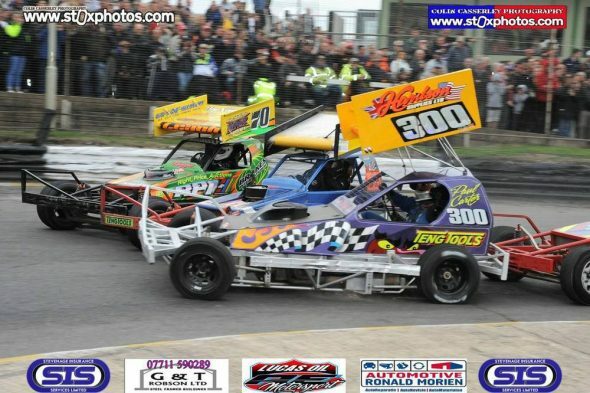 The leader (103) pulled off before the restart, allowing 484 to inherit the top spot ahead of 501 and H525. Paul Hines was the highest of the star graders in seventh. 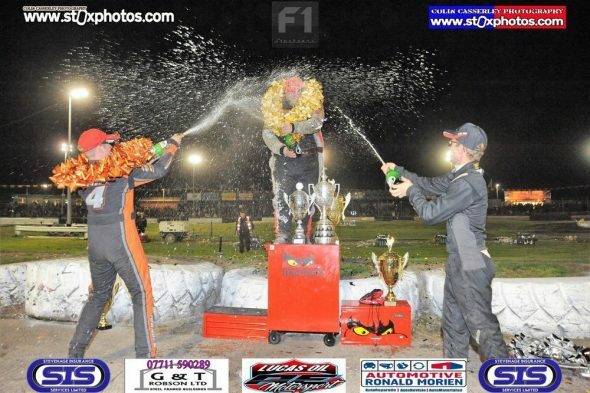 Green, Wainman and Harris were also picking their way through the field. Nigel Green was up to third by the halfway stage and soon had taken the lead away from Hines. 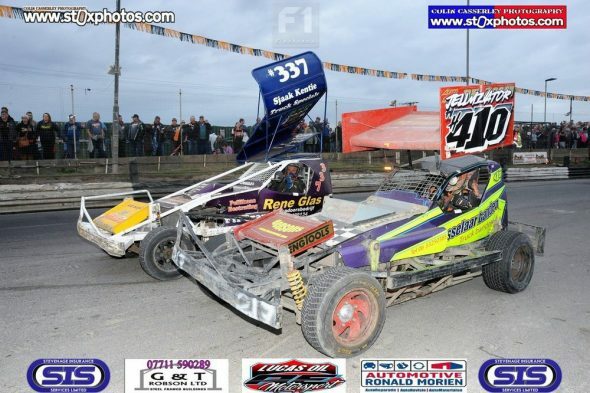 As the lap boards came out, it was 445, from 259, with 515 and 84 battling for third. The laps wound down, with Green clearly in control out front and Hines comfortably in second. 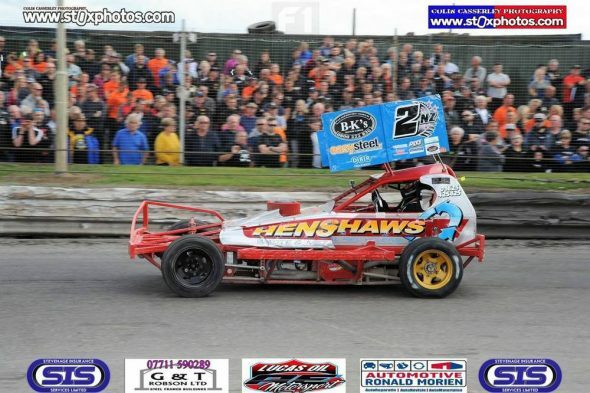 Wainman almost had third spot from Harris on the last bend but missed out by a couple of inches on the line. 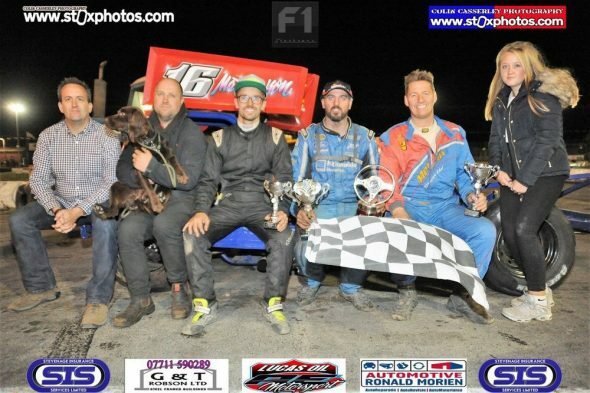 The Grand National, for the Ben Turner Memorial trophy raised 33 cars with 445 taking the lap handicap. 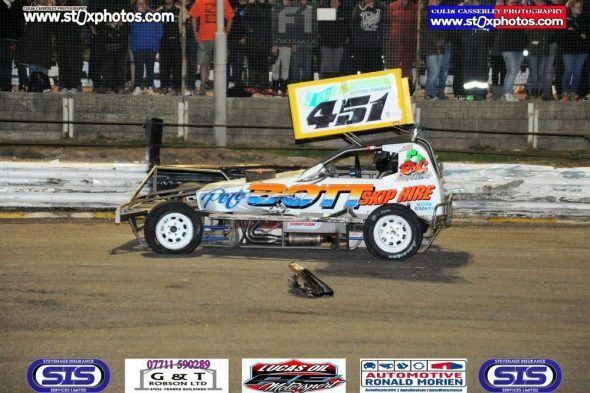 Trophy holder FWJ struggled from the start and was never in contention but Tom Harris was on a charge, carving his way through the field until he was slammed into the fence by H177 on turn 2, scraping down the wall on the straight. 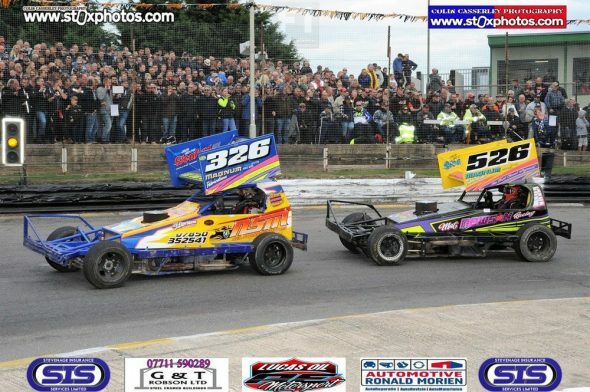 The two cars stranded at the end of the back straight brought out the yellows. 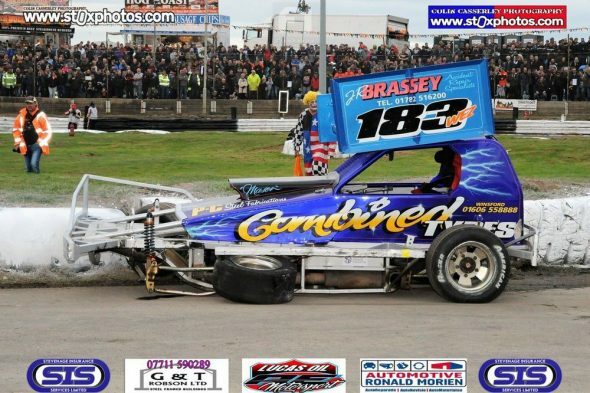 Harris was forced to retire with a flat rear tyre. 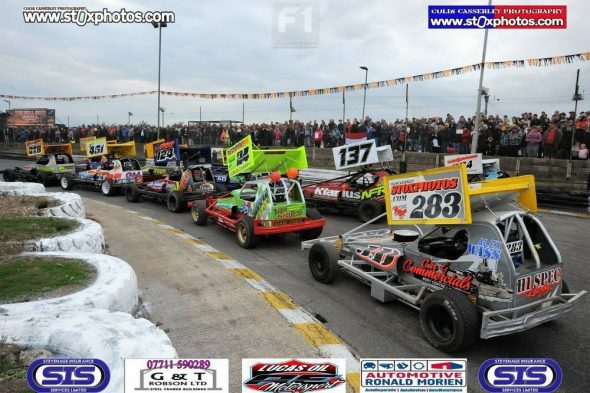 The order at the restart was: 172, 213, 501, 37 and 484. Newson was the highest of the superstars. 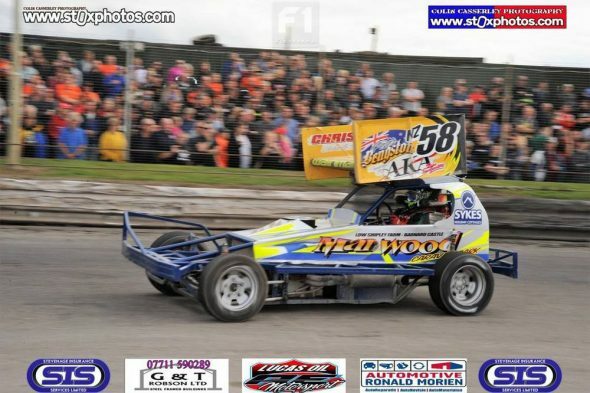 172 tangled with 555, bringing out the caution again. By this time, the lead was with the 16 car, who had final winner Green right behind him. 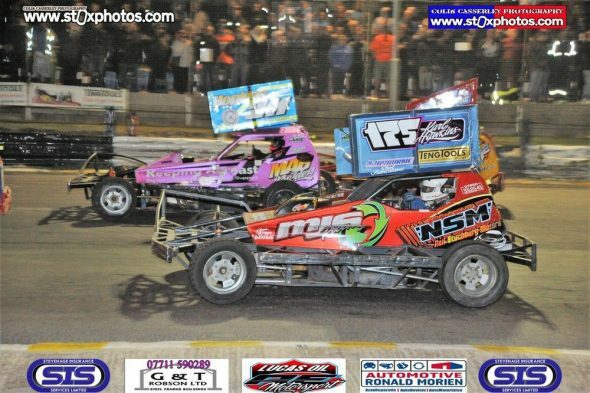 Paul Harrison was up to third but behind a backmarker for the restart. The flag dropped and, as Green was sticking with Newson, it looked like the former World Champion would pick up a final and GN double. 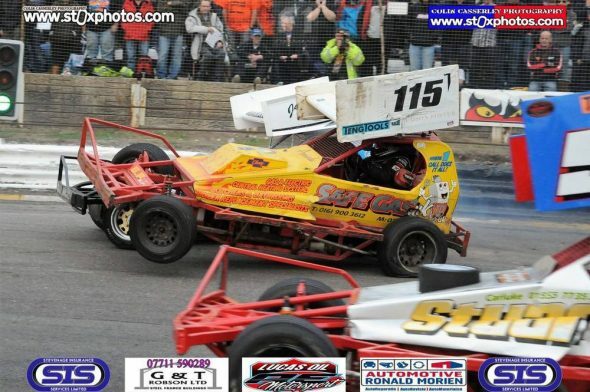 The 445 driver was clearly biding his time until the last bend, but Newson was having none of it. 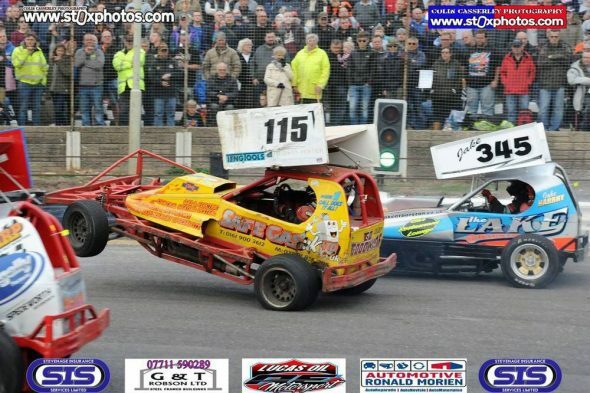 Knowing what was coming, Newson put the brakes on on Green going into the last corner. 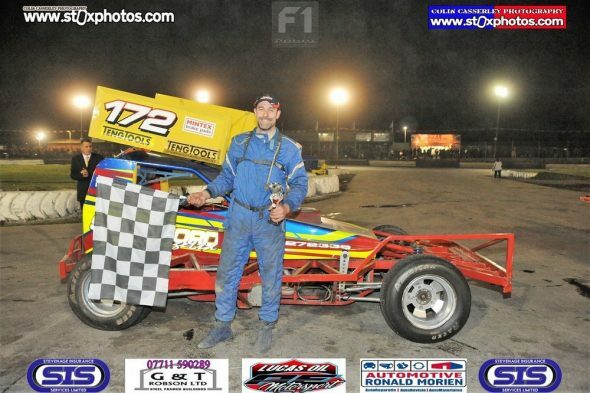 Newson survived to take the victory. 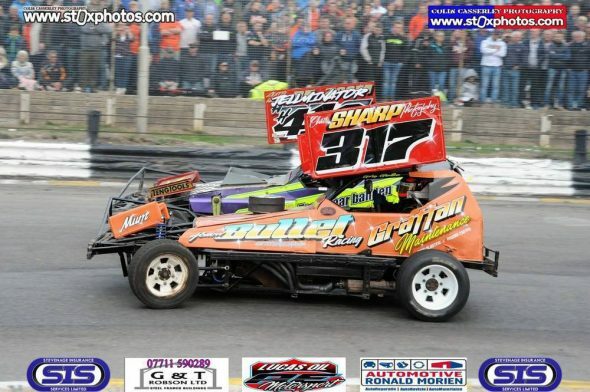 The drag race to the line between 445 and 2 resulted in a very unhappy Nigel Green taking second.